Thai government has made digital television a priority, so they’ve launched a program to give a 690 Baht voucher ($21) to all households in Thailand. 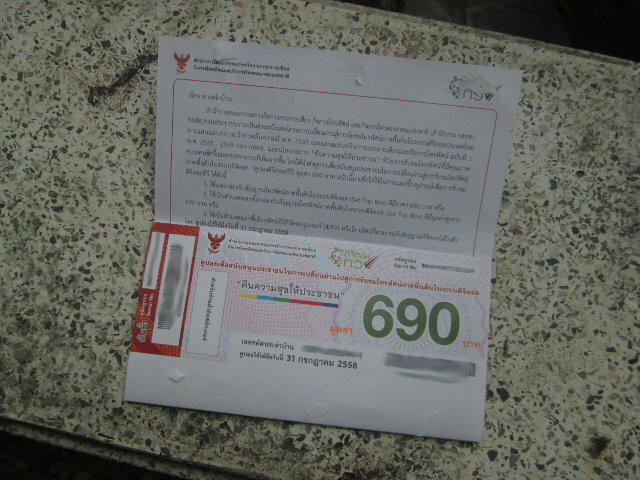 The voucher is send by registered mail to your home, and delivery has to be signed by a Thai person. Then you can go to a shop equipped with a Thai ID card and house registration book copy, present this voucher, and get a free (except for tax payers of course) DVB-T2 receiver, or use it to buy something a more advanced set-top box or digital TV package with 690 Baht discount. 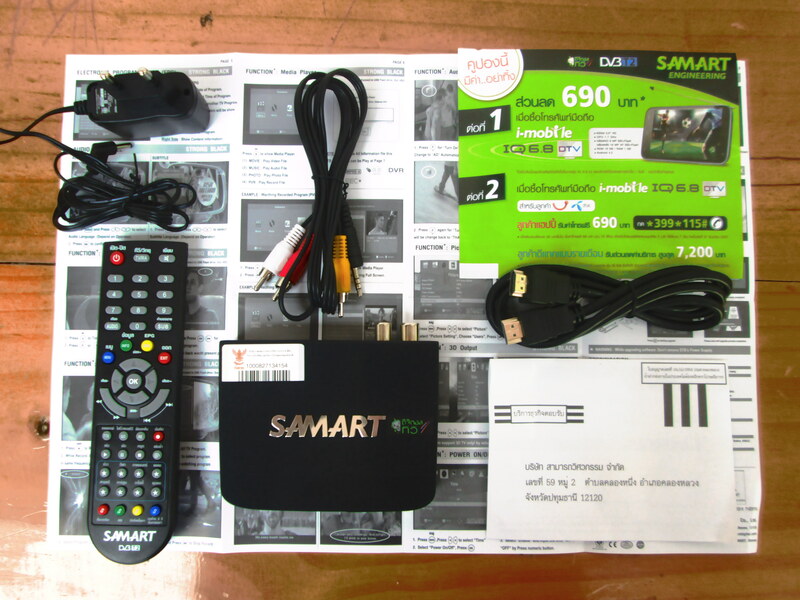 We decided to get a free DVB-T2 receiver, and ended up with a box called SAMART Strong Black supporting SD and 1080p video streams over DVB-T2, EPG (Electronic Program Guide), and with a USB port to connect devices for recording programs or time-shifting. SAMART is a Thai company whose name means “can” (formal) as in “we can”, not as in “beer can”… So I decided to have a closer look at the device, and report what kind of features and hardware a $21 DVB-T2 may have. Other features include 3D display support, picture adjustment (color/brightness/contrast), 7-day EPG function, USB hard drive for PVR, time-shifting, and firmware update functions, multiple audio and subtitles, automatic and manual channel scanning and so on. 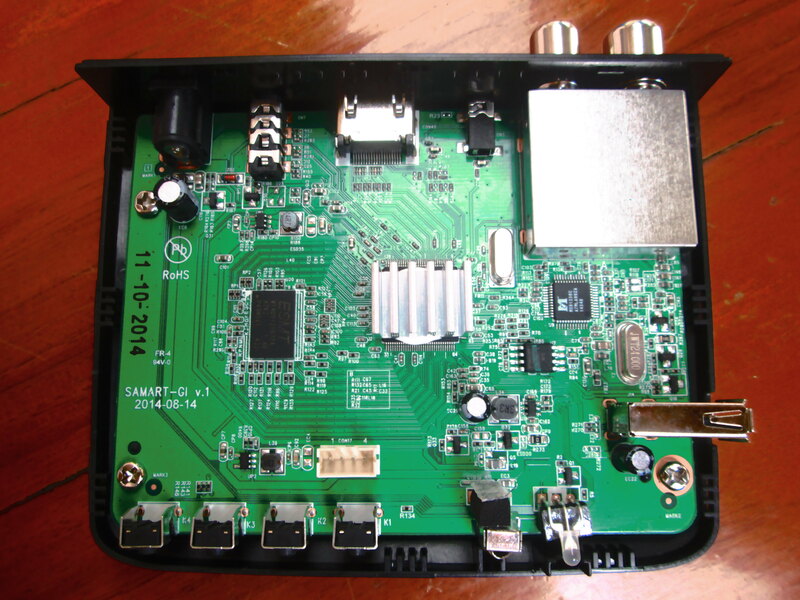 That’s the pretty package for this DVB-T2 receiver box. The box comes with HDMI and AV cables, a 5V/1.2A power supply, an IR remote control with two AAA batteries. a warranty card, a user’s manual (strangely in English only), and some promotional brochure. I’m not exactly sure that 5V/1.2A will be able to handle an external 2.5″ HDD, we’ll have to see another day. Let’s have a closer look at the device itself. There’s a government sticker on the top of the box to make it clear that box was “sold’ as part of the program. Four buttons are on the front pane: power, Ch+/Vol-, Ch+/Vol+, and Exit/Menu, as well as the power LED, and a window for the IR receiver. The USB port is on the right side of the box. The rear panel comes with the following port from left to right: RF antenna connector, RF loop, jack for optional IR extension cable, HDMI output, 3.5,mm jack for composite and L/R audio, and power jack. There’s a two year warranty with the device, which I may have well lost, since as usual, I open the enclosure. There aren’t any screws, so you have to pull the top of the box with some tools. 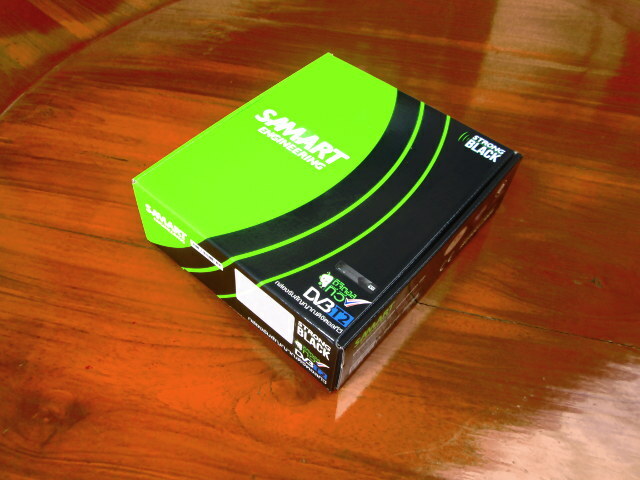 The board name is SAMART-G v.1, so it looks like it’s really a locally designed and manufactured product. The processor has a small heatsink on top, but I failed to remove it because the thermal paste would have to be softened with heat, and I don’t have the right equipment for that. But we can still check the other components: ESMT M14D5121632A is a 64GB DDRII RAM, and Mstar MSB1236C must be the demodulator. I’ve also open the shield on top of the tuner to find out the device uses MaxLinear MxL608 tuner, which appears to be quite popular, as over 10 million STBs feature this tuner. Since I did not have full details about the processor, and the operating systems, I decidd to connect a USB debug board to the 4-pin connector on the board. The left and right are respectively ground and 3.3V pin, so I played with the two other pins, and selected various baud rate, but all I got on my minicom terminal was gibberish. A Google search for 550 MHz processor used in STBs points to Mstar or Novatek processor, but since neither company list their products lists on their respective website, it’s still unclear which exact processor might be used. I could only find one STB with star 550 MHz processor, and another one with Novatek 550 MHz processor. My guess goes towards Mstar since they’ve used an Mstar demodulator in their design. We tried it at the shop, and it worked fine, but my indoor antenna at home must be too old, as the signal was 0% even though I live close to the broadcasting antenna. I tried to get a 300 Ohm to 75 Ohm matching adapter to make my own antenna, but I was told they don’t do this in Thailand, it’s old tech. maybe a language problem. So instead I purchased the matching adapter on Ebay, together with a cheap Digital TV indoor antenna. There is no such thing as a “digital TV antenna” — all electromagnetic waves are analog. It is the transmission mode (helpful summary of modulation types at https://en.wikipedia.org/wiki/Modulation) which differs between “analog tv” (vestigial sideband modulation, a type of AM, for video, usually FM for audio) and “digital tv” (COFDM for DVB). The antenna just picks up the electromagnetic waves and has no awareness of the type of modulation, monochrome or color, picture definition, or whatever. The important thing is that the antenna is suitable for the frequency of the transmission eg “rabbit ears” style for VHF transmissions, and a mini log periodic or dipole plus reflector for UHF transmissions. The branding of TV antennas as being “digital” is just a marketing ploy. Some even go so far as to label their antennas as not just “digital” but “HD digital”. Thanks for the correction. I’ve updated the post saying I bought an “indoor antenna”. That one to be exact: http://www.ebay.com/itm/181442715552?_trksid=p2059210.m2749.l2649&ssPageName=STRK%3AMEBIDX%3AIT which is supposed to support both VHF and UHF. I can’t buy 300 Ohm to 75 Ohm (4:1) matching adaptor in Thailand too. So, I take it from old TV antenna. In Chiangmai, biloop antenna with reflector should work fine (http://pantip.com/topic/32813757#). It cloud be made DIY easily. One loop has impedance approximately 133 Ohm. Parallel of two loops for half impedance (133/2=66). Connecting to 75 Ohm may work without 4:1 balun matching adaptor but we need 1:1 balun. Just winding coax cable. Ah OK.. It’s based on your “diamond” antenna build that I was certain the seller misunderstood me. I’ve bought one from Ebay. Thanks for the update. Indoor antennas are actually quite cheap (~290 Baht). Well looking at the photograph of the antenna which you have bought, it is not something I would have recommended, and would be surprised if it picks up an adequate signal unless in a location of reasonably high signal strength close to the transmitter. Of course with digital TV, it is the signal to noise ratio which is important, because generally digital tv is an either you get enough signal or your do not, or if just on the borderline (or too many errors due to local electrical interference eg unsuppressed motor) then a pixellated mess. and for VHF something with rabbit ears. Remember for optimal signal pickup the size of the active dipole needs to be related to the wavelength of the transmission — hence the long rods of rabbit ears for the longer wavelenght VHF and the short “bow tie” style dipole for the shorter wavelength UHF. So a flat rectangular “plate” antenna approximates to neither. As Scotty the Engineer would says “”Ye cannae change the laws of physics!” even with lots of electronic amplification which often makes things worse. Of course these indoor antennas are poor substitutes for “proper” fully size antennas which are to be mounted outside or in sometimes where signal is sufficient in the attic/loft space (obviously not where there is a metal roof or where there is lots of metal objects or pipework). I live 6 to 7 km (LOS) from the transmitter, so I’ll maybe it will be good enough. If it does not work, I’ve bought a 300 to 75 Ohm matching adapter, and I’ll try to make a DIY antenna (http://www.cchsu.com/art-en/2009/06/27/114/) which looks somewhat like the UHF antenna you linked to. 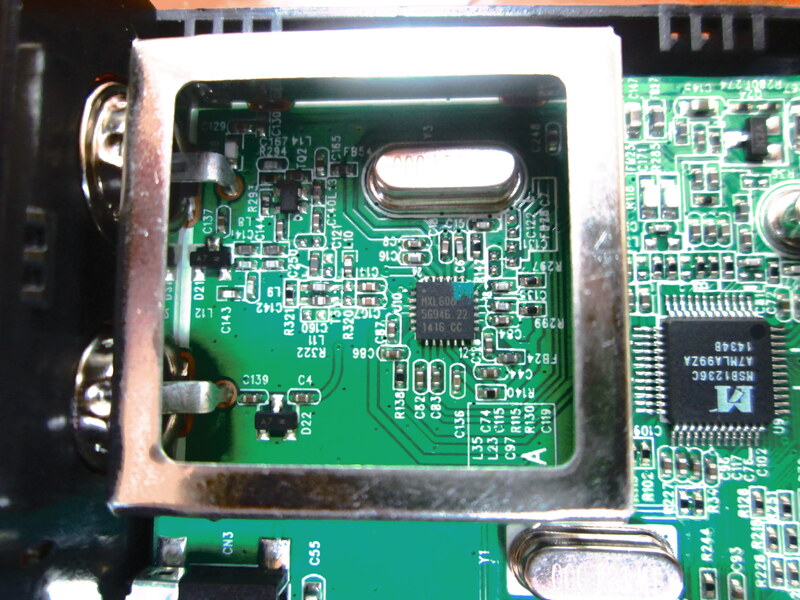 I looks like MStar MSD7802 is usually paired with the MStar MSB1236C so I guess it’s the case with this receiver, I have DVD-T2 receiver which got both of the chips (I decided to not solder off the shielding box and checkout the tuner). I bought a mygica dvb-t2 usb stick but I can’t get any signal with bundled very small passive antenna in Bangkok. Did you managed to get signal with indoor antenna in Chaing Mai? Yes, but not in my office, only in other rooms. I’m about 8 km from the base station, so if you are a bit further, or some buildings / walls attenuate the signals, you won’t be able to receive DVB-T2 signals properly. I got a free outdoor antenna when I bought another TV, and since then it’s working well in my office. The antenna is quite small, and I think it sells for about 350 Baht. samart strong disposable non malay channel. anyone here know where to purchase this item online and able to ship oversea? I don’t know if they ship overseas however.